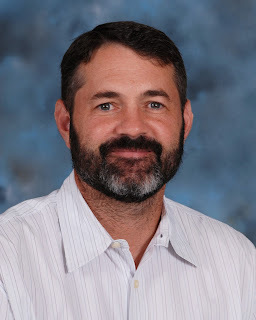 Cuyamaca College dean Scott Herrin spent years going to college to get his bachelor’s and master’s degree, and ultimately a doctorate in educational leadership. He’ll be adding one more diploma to his wall next week: an associate degree from Cuyamaca College. After a year of taking classes online, Herrin will be receiving an associate degree in lifelong health and well-being when Cuyamaca College holds its commencement on Wednesday. Herrin said he earned his other degrees to advance his professional career, while this degree was simply a learning experience – about both the subject and to delve into the student experience. More than 2,100 students will be receiving degrees and certificates at the Grossmont College and Cuyamaca College commencements on June 1 and 2. Here's the story of one amazing graduate. Maysaa Madhat Najih Ibrahim is all about overcoming challenges. Single mother. Refugee. No matter. Ibrahim is one of six valedictorians graduating at Cuyamaca College’s 38th commencement ceremony on June 1. She’ll be headed to San Diego State University in the fall on her way toward becoming a Spanish teacher. “I want to encourage students, single mothers and refuges to continue their education because nothing is impossible to achieve with hard work,” Ibrahim said. 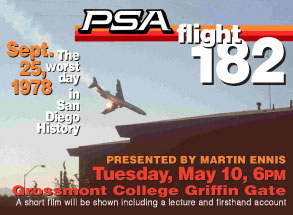 Amaziing stories arise out of the graduating classes of Grossmont and Cuyamaca colleges every year. Here's one about an Iraqi refugee whose images of her war-torn motherland are forever seared in her mind. They're what inspires her to want to help people. Sandy Adwer is graduating from Grossmont College with an Associate of Science degree in human biology. In the fall, she will be attending the University of California, San Diego, where she will pursue a bachelor’s degree, also in human biology, with plans to eventually attend medical school to become a physician. Nearly a decade has passed since the then-12-year-old and her family were forced to flee the turmoil and violence of Iraq, where they were in peril as sectarian crossfire ravaged their homeland. Sandy lived for the next five years in Syria. 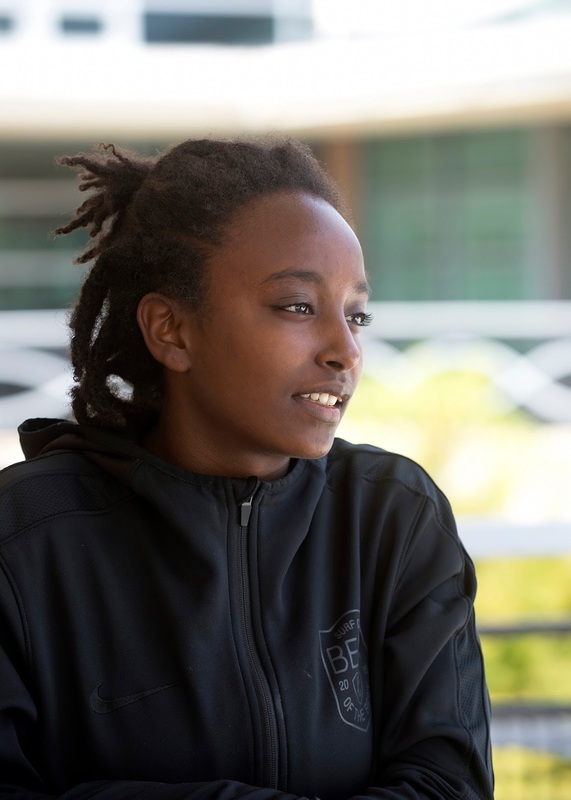 Her father ventured on his own to Sweden to try to find refuge for his family, only to be denied residency. He returned to Syria, which soon was thrust into the tragedy of its own civil war. Rebekah Shtayfman refused to give up. Even after dropping out of high school, becoming a single mom at 18, and – at times – sleeping in her car while looking for a permanent home for her and her daughter, Shtayfman persevered, never losing sight of her dream to pursue a higher education. 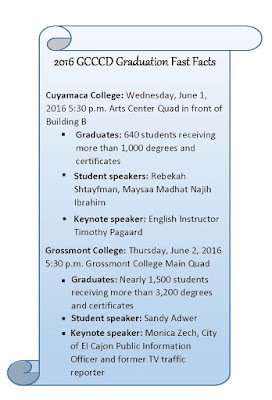 Now, as a result of her determination and hard work, Shtayfman is graduating with honors from Cuyamaca College. She has been accepted to UC Berkeley, where she will be majoring in physics beginning this fall en route toward her goal of earning a doctorate and becoming a college professor. 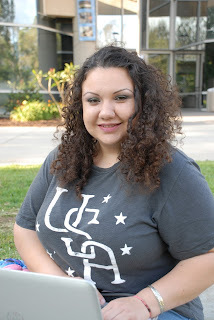 She credits Cuyamaca College for playing a pivotal role in her journey. A busy academic year highlighted by new leadership at Grossmont and Cuyamaca colleges culminates with commencement ceremonies June 1 and 2, where more than 4,200 degrees and certificates will be awarded. With many students receiving multiple credentials, about 640 Cuyamaca students will receive more than 1,000 degrees and certificates at the college’s June 1 commencement, followed the next day by almost 1,500 Grossmont College graduates who will receive more than 3,200 degrees and certificates. 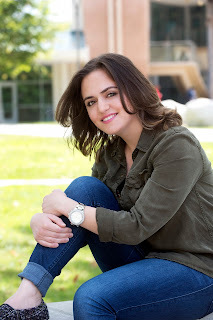 Both commencements begin at 5:30 p.m. Cuyamaca College, at 900 Rancho San Diego Parkway in Rancho San Diego, will hold its 38th annual ceremony led by President Julianna Barnes in front of the B building, the Communication Arts Center. President Nabil Abu-Ghazaleh will lead the 55th annual ceremony in the Main Quad of Grossmont College, at 8800 Grossmont College Drive in El Cajon. 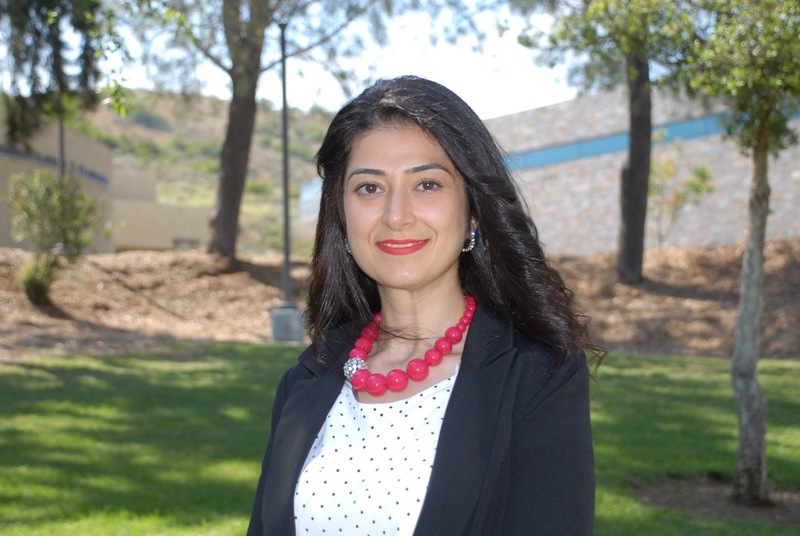 Both Abu-Ghazaleh, who started working at Grossmont College in July 2015, and Barnes, who started at Cuyamaca College in October 2015, will be leading their first commencement ceremonies. Cuyamaca College was awarded a $1.5 million state grant this week that expands on the college’s innovative programs to dramatically increase student success by reducing the remedial pipeline and better preparing students for college level coursework. “Cuyamaca College is deeply committed to student success for all students. 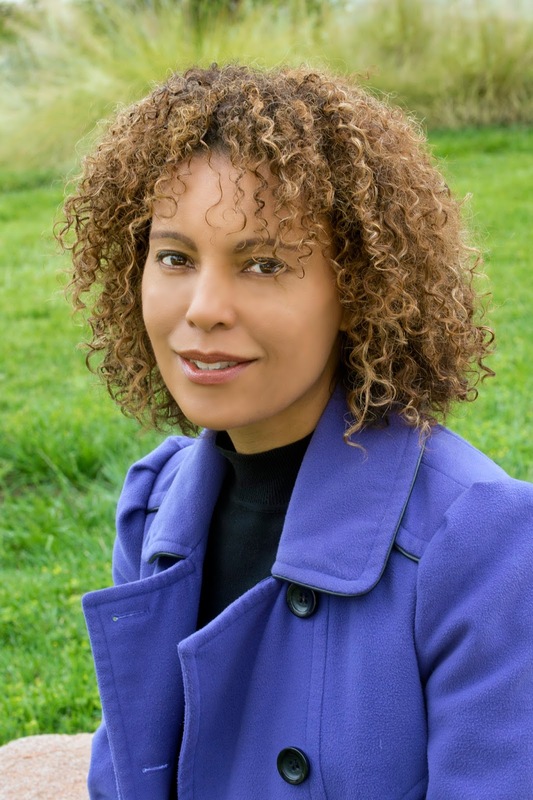 This grant will allow us to build upon efforts that shorten the bridge between developmental education and college completion,” Cuyamaca College President Julianna Barnes said. More than three-quarters of California community college students who take assessment tests before enrolling are assigned to one or more remedial courses in mathematics or English. Relatively few of those students successfully complete college-level courses in those subjects and go on to earn a degree or certificate. However, studies have found that the students could have succeeded if they had been enrolled in college-level math and English courses. The Basic Skills and Student Outcomes Transformation Program grant enables Cuyamaca and other colleges across the state to pilot innovative programs that better serve these students. The three-year grant to Cuyamaca College is among $60 million being distributed statewide by the California Community Colleges Chancellor’s Office. It will enable Cuyamaca College to remain at the forefront in rewriting the rules for remedial education. 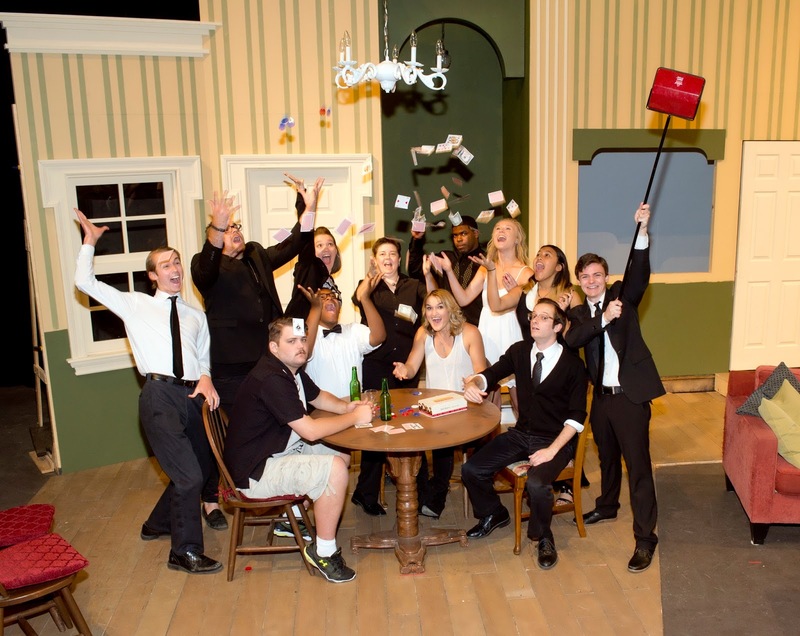 Amazing stories come out of the graduating classes of Cuyamaca and Grossmont colleges every year. Here's one about Cuyamaca's oldest grad who, at 80, isn't ready to call it quits. Octogenarian Barbara Sue Adkins has the energy and grit that would put a person a generation younger to shame. That the 80-year-old is the oldest graduate of the Grossmont-Cuyamaca Community College District’s Class of 2016 draws a chuckle and a contemplative pause from the El Cajon resident, who has earned a certificate of achievement in Child Development from Cuyamaca College. Only a couple classes shy of a full associate degree, Adkins has every intention to return to the college to finish what she started in 2010. Then it’s onward to a bachelor’s, she said. 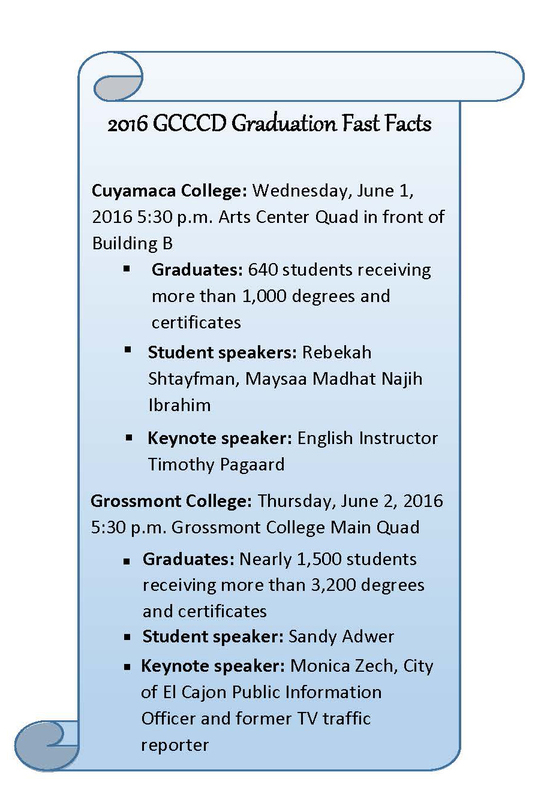 Amazing stories arise every year from the graduating classes of Grossmont and Cuyamaca colleges. Here's one about a gifted athlete who's been recruited to play Division 1 soccer as an incoming junior. And she's all of 17! Most days, Grossmont College student Hinsseenee Regassa is a blur of motion, always in a hurry to get things done. That drive for speed serves her well on the soccer field as an elite player with Olympic and professional aspirations. And the same goes with her academic pursuits. At 17, she is about to become the youngest graduate in the Grossmont-Cuyamaca Community College District’s Class of 2016. What’s more, the Santee resident has accomplished this feat with honors at Grossmont College in just a little over a year. Come fall, Regassa will be playing soccer for UC Davis, where she will be a scholarship transfer as a junior. Rachel Becker didn’t know anything about the Arabic language until she became close friends with two Iraqi refugees who were classmates at Cuyamaca College. 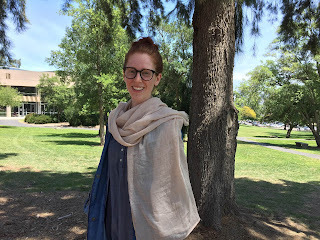 Now the 21-year-old Spring Valley resident is on her way to Jordan through a fully-funded, U.S. Department of State-sponsored immersion program to study the language while living with a host family over the summer. That shouldn’t be a problem. Becker will undergo approximately one academic year of university-level Arabic coursework during the eight-week program, and she is not allowed to speak English while in school or with her host family. Make your summer count! Here are some of the top reasons why taking classes at East County’s two colleges is a good idea for you this summer. 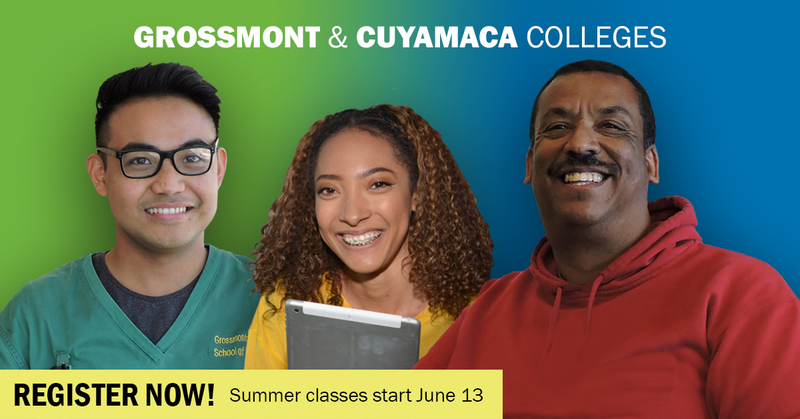 Whatever your reasons are, Grossmont and Cuyamaca colleges are here for you. Registration is open now, and classes start June 13. For links to summer course schedules and application info for both colleges, go to www.gcccd.edu/now . Thornton has spent the past six years as a mentor to two foster siblings, one now 20 and the other who will be 18 in June. Not only has she devoted in excess of 2,200 hours to the San Diego County Foster Youth Mentor Program, during that time, Thornton – through Step Up Foster Youth Ministry at The Rock Church in Point Loma – also has helped guide and support more than 170 other adults who also have become mentors. That’s roughly one-third of the total number of people taking part in the county’s Foster Youth Mentor Program. A shower of 2,000 golf balls is anticipated for the May 6 Brad Daluiso Golf Classic at the Sycuan Golf Resort, an annual fundraiser hosted by the former NFL kicker for the Grossmont College athletic program. The golf balls will be falling from above at 4 p.m. as balls purchased by supporters are dropped from a helicopter hovering about 50 feet in the air. The lucky winner whose numbered ball lands in or closest to the hole – in this case, hole No. 1 at Willow Glen Golf Course -- gets a $1,000 Sprouts gift card. Other prizes include a Sonos PLAYBAR sound bar, Sycuan overnight stay with golf, Padres tickets and a TaylorMade M2 460 driver. And you don’t have to play in the tourney or be present to win – just purchase $5 for one ball, $20 for five, $50 for 15, $100 for 40 or $250 for 125. You can obtain the purchase form at www.foundation.gcccd.edu/bdgc .The deadline for purchasing the balls is May 4. Cash, credit cards and checks will be accepted for ball purchases at the tournament until 3 p.m. It is still the deadliest air crash in the history of California and was the deadliest in the country at the time. All 135 people aboard the PSA Boeing 727-214 perished along with two in the Cessna and seven people on the ground. Nearly two dozen homes were damaged or destroyed. Winner of four Tony Awards following its Broadway debut in 1965, The Odd Couple finds the mismatched neat freak Felix Unger being thrown out by his wife and moving in with his divorced, slovenly friend, Oscar Madison. Hilarity ensues when Oscar’s untidy, yet happy life of excessive gambling, smoking and drinking collides with Felix’s need to obsessively clean up after and criticize others. The characters were revived in a 1968 film and a 1970s television series. The 2 p.m. performance on May 14 will feature two professional American Sign Language interpreters. “There is a lot of preparation involved; it is not something you could just do,” said Jennifer Carmean, an American Sign Language instructor at Grossmont College who is working with Denise Robertson, an interpreter coordinator with Disabled Students Programs & Services, in organizing the interpretation services. Interpreters must review the script and coordinate with the actors involved to ensure they are interpreting each character correctly. 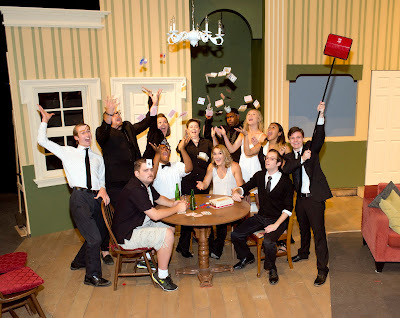 Interpreters also must decide on who will interpret what characters and where they should be placed so they can be seen – but not get in the way – in relation to the furniture, lighting and props.